It is a sad time for Ivory Coast stars, Kolo and Yaya Toure as they have being told that their brother is dead while the duo were on national duty in the world cup. The Ivory Coast football Federation, in a statement said that, Ibrahim Toure, the younger brother of Premier League-based Ivory Coast duo Yaya and Kolo Toure, died at the aged 28. He died in Manchester after battling with cancer - the same day the pair were in the squad for Ivory Coast's 2-1 loss to Colombia. It is understood Ibrahim was receiving chemotherapy for his illness at The Christie, and Yaya regularly visited his sibling. The football governing body in Ivory Coast pledged its full support to the Toure family. The statement read: “Kolo and Yaya Toure just heard about the death of their young brother, Toure Oyala Ibrahim. The entire Ivorian delegation want to show their support to the players. “The football Ivory Coast federation president (FIF) and the Executive Committee announced to the entire family of Ivorian football the death of Toure Oyala Ibrahim, the younger brother of Toure Kolo Abib and Toure Yaya Gnegneri, which happened on the 19th of June in Manchester (England). 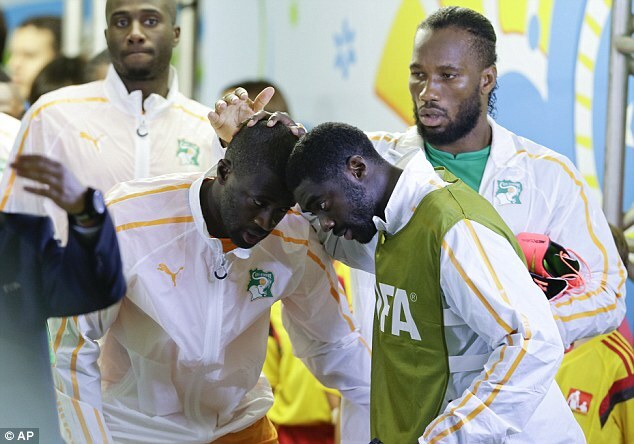 “In such a sad situation, the players from the Ivory Coast national team, and the entire delegation here in Brazil, show their support to the Toure brothers and their whole family. Ibrahim Toure played as a striker, most recently with Lebanese Premier League outfit Al-Safa' SC. The Ivory Coast currently lie second in World Cup Group C and face Greece in Fortaleza on Tuesday.